I last wrote about CFR (Caile Ferate Romane) — the government-run railroad company — in 2006, and — in spite of the repeated government bailouts and consulting firms who have been called in to help them re-structure, and the IMF directives for their improvement — things have gotten no better. 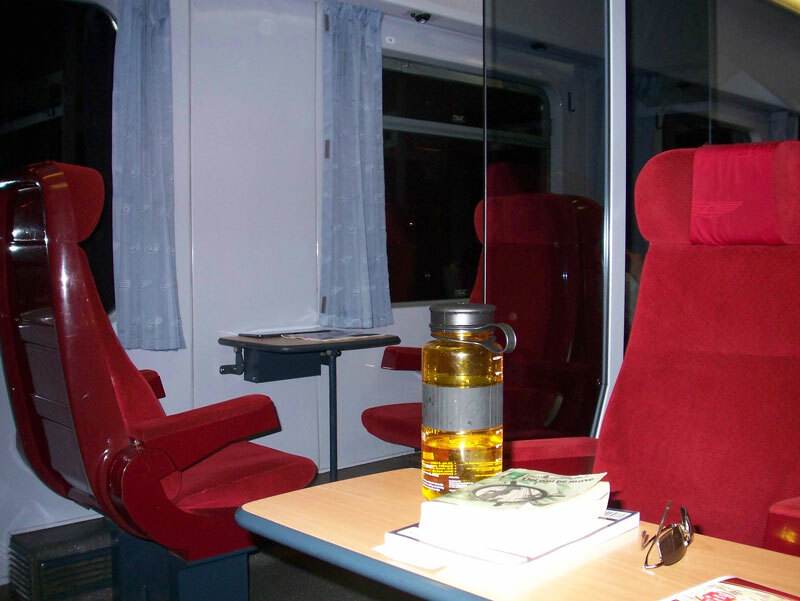 Ligia and I rode on an InterCity train today, from Cluj to Medias, in what was supposed to be 1st class. In my last article on the matter, I concluded that at least 1st class on the InterCity still meant something. It did, back in 2006. Now it no longer does. This is how the 1st class wagon looked back then. Now they’ve done away with the glass dividers, and with most of the tables between the chairs. They’ve also faced most of the chairs forward, so they could fit more of them into the wagon. It looks like you’re riding in a bus. They’ve killed 1st class. Another thing which I dislike is a cheap populist move on the part of Romanian politicians, whereby they granted old folks the privilege of riding 1st class for free. So what you end up with is paying 1st class prices for the questionable privilege of being stuck in the same wagon with a bunch of rude, loud (and smelly) old people from all walks of life, who love to complain (loudly) about everything during the trip. I can understand the need to make travel more affordable for older folks who live on a limited income, but when you also kill 1st class in the process, which is the place where you make your better profit margins, that’s just not smart, nor is it in any way polite or respectful to the people who pay their own way for 1st class and expect to get clean, deodorized wagons and a little peace and quiet during their travels. Things have gotten so bad with the CFR that 1st class is no longer a luxury — it’s almost a necessity. Riding in 2nd class or 3rd class on most trains means putting up with ungodly stenches, filthy chairs, smelly people and bathrooms you’d rather burn than use. Any way you split this hair, the people in charge of the CFR end up looking like a right bunch of ninnies. It seems to me the CFR management has had tons of time to turn the company around. They’ve been offered countless opportunities to mend their ways. But the more time and opportunities they get, it seems the more determined they are to run the company into the ground. It’s a painful realization for me, because I like train travel, and I have had wonderful experiences traveling by train as a child — you know, back when 1st class was actually a luxury, 2nd class was clean, and 3rd class was presentable.